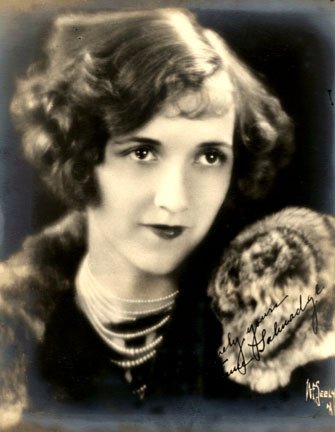 Constance Talmadge was the youngest of three sisters, all of whom went into films. She was born April 19, 1899, in Jersey City, NJ, and moved with her family to New York City where she attended public school. Her mother, Peg, had always pushed the daughters toward acting, and Constance got her break at Vitagraph where older sister, Norma, was an established actress. She did bit parts for awhile and then had her first lead in "Buddy's First Call" in 1914. She made several comedies for the company until mid-1915 when the family moved to California. She worked for two years at Fine Arts-Triangle where she got her first real notice as the Mountain Girl in "Intolerance" (1916). It was during this time that she struck up a life-long friendship with Dorothy Gish. Sister Norma married producer Joseph Schenck in 1916, and he and Lewis J. Selznick began producing a series of comedies throughout the late 'teens that made Constance one of the movies' most popular comediennes. As the story goes, Constance decided to elope with businessman John Pialoglou in December, 1920, and talked Gish into joining her in a double ceremony. Gish married James Rennie, but neither marriage lasted long. Constance's popularity continued throughout the twenties with 24 feature films, 12 of which were made with Harrison Ford as her leading man and seven with Kenneth Harlan. Few of her films are available for viewing today, but "A Pair of Silk Stockings" (1918), "The Primitive Lover" (1922) and "The Duchess of Buffalo" (1926) are all on the home video market. Constance married again in 1926 to Scotsman Alistair MacIntoch, which lasted about a year. In 1929, she married Chicago businessman Townsend Netcher, but this marriage failed, too. Constance retired from films in 1929 after one last silent, "Venus," but she was a wealthy woman and had no need to work. She married one last time to stockbroker Walter Giblin to whom she remained married until his death in 1964. During World War II, she worked as a Red Cross nurse, and continued volunteer work in hospitals after the war. She died a wealthy society matron Nov. 23, 1973, having outlived both her sisters.